Cannas and other summer flowering bulbs are easy to plant. Learning how to plant summer bulbs is a great skill any gardener can acquire. Summer flowering bulbs provide a welcome burst of color in the garden with unusual varieties. Like annuals, most summer flowering bulbs will not live through cold winters, and must be dug up at the end of the growing season and stored if you wish to plant them again the following year. Others should be treated like annuals, planted, enjoyed, and replanted from new bulbs the following year. One of the great joys and delights of learning how to plant summer bulbs is the sheer variety of flowering bulbs available. From cannas to gladiolus, you can find and plant summer flowing bulbs that thrive in your garden. The term "bulb" loosely refers to a set of plants grown from rootstock. You can purchase these as bulbs, tubers, corms or other root parts at your local garden center starting in the spring. Tuberous Begonia: Like their annual counterpart, tuberous begonias do well in partial shade. Tuberous begonias, however, have much larger flowers. Some produce rose-shaped flowers, while others entice with double the blossoms of the average begonia. Colors range from bright yellow to stately red. Plant the tubers in springtime. Tuberous begonias bloom summer through fall. 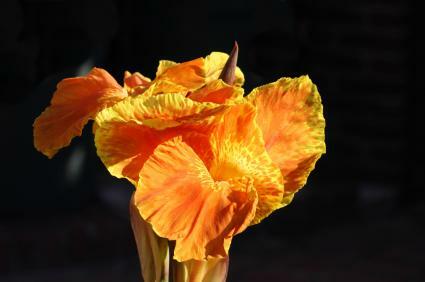 Canna: Tall, dramatic cannas have spiky leaves and long shots of rich color at the tip. Flower colors include red, rose, yellow and shades of pink. Plant the rhizome, or root part, in the spring as soon as the soil can be worked and after danger of frost. Blooming time is mid summer. Dahlia: Dahlias are show-stoppers, ranging from diminutive varieties to the so-called dinner plate varieties that promise chrysanthemum like flowers the size of plates. With nearly every color under the sun available, as well as so many sizes to choose from, most gardens have a place for a dahlia or two. Plant the tuberous roots in spring after all danger of frost is past, and enjoy the show in late summer through fall. There are many, many more choices of spring flowering bulbs. North Carolina State University's horticulture department has a chart with many summer flowering bulbs listed, planting times and depths, and cultivation information. Planting summer bulbs is fairly easy, but it's important to change your technique and plant each type according to its individual requirements. Most bulbs, roots, corms and tubers prefer well-drained soil, so site preparation is a must. They also prefer sun to partial sun, and need at least four hours a day of direct sunlight. Always read the package directions carefully when you purchase summer flowering bulbs. Each package should include the planting depth. This is important. Some bulbs won't grow if they're planted too deep. The bulb will simply rot away. Other varieties need to be planted with certain parts facing up, and others facing down into the soil. It varies according to the bulb, so check the package. Till or turn over the soil to a depth of approximately 6 to 10 inches. If your soil is especially heavy or clay, add compost or well rotted manure to improve drainage. Sandy soils may lack nutrients and will also benefit from the application of a good manure or compost. After amending the soil, smooth it over with a rake. If the manure or compost is fresh, let it sit for a few weeks to ensure it breaks down properly in the soil. Always plant summer flowering bulbs in the spring after the soil is warm to the touch. It's best to wait until the frost free date for your gardening zone. The frost free date is the average date of the last frost, and a general guide to a safe planting time for tender annuals, perennials and vegetables. Most summer flowering bulbs are planted in a shallow indentation. Using a trowel and following package directions, dig the hole and place the bulb, root or corm in it. Cover with soil and tap it down with the flat of your hand or the trowel. Water bulbs well, but don't overdo it. Once the bulb begins growing and flowering, it may require more water. Summer flowering bulbs are very easy going and generally do not need fertilizer if you amended the soil with a good quality compost. A dose of a balance 5-10-5 or 10-20-10 fertilizer can keep plants blooming and thriving.